Spotted this in the Hull HMV not sure if nationwide. 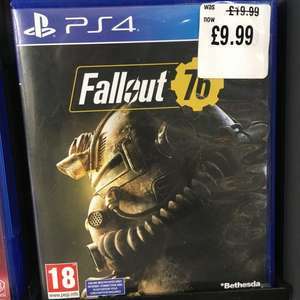 Fallout 76 for £9.99 best price I’ve seen it for. Not really as i used to have 3 near me and now that they all have closed, the nearest one is 20 miles away and still their online store isn't back up and running they will close their doors for good soon enough. It is yes but if if it needed to be done to save the company then I agree with the decision. See this all over this site and to a lesser extent the internet. But where did it originate? Onkyo, Onkun, unknown brand, buy a Sony, yoghurts and then the reverse joke of taking it all seriously. Long may these continue. My comment isn't based on me being a vinyl geek at all, I actually don't own a turntable. I know that CD's are both cheaper and offer better sound than vinyl. It's based on basic knowledge that spending money on vinyl and playing on this is both pointless and will slowly damage your vinyl that costs a lot of money. Okay makes sense in that when i set my turntable up I had to adjust the counter weight until the arm was finely balanced and could be just lowered on to the record. It will over time. This table won't have an adjustable counterweight, and likely won't be set up well as it's cheaply manufacturered. So yes, it will either push too much or too little on many records and cause damage over time. You're much better off with a decent set of speakers and digital music over this, that'll provide better sound quality. If you want a budget turntable there are plenty of good options, the Audio Technica LP60 is a great choice, and yes it's more expensive, but it'll provide a much better experience. Have you tried this with RS? 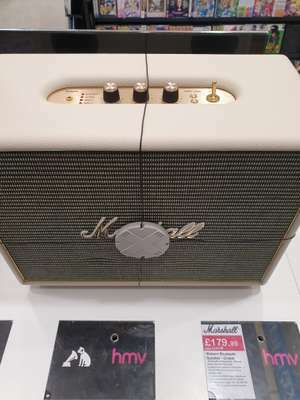 HMV does not have these on line and I really much doubt it Richer Sound will price match if you show them a picture of these. I'd definitely buy that if it were local. I'd love a drone but it's one of those toys that I couldn't financially justify. I could at a tenner! Heat added. Got one Today at Hull store...didn't notice the with any purchase bit and it just got out through the till on its own for £12.49 (4k) so either got lucky or they wasn't botherered about making me get the deal. Plenty left! Ah. Missed the 'with any purchase' bit. Annoying. Good price but not to my tastes. Assassins creed odyssey spotted in HMV Stirling for £19.99 on both Xbox one and PS4. People still buy this environmentally destroying trash? I think so! Also I'm trying to post the pics but they won't upload. I’d pay that if my hmv hadn’t closed down a month ago. Looks like this has been added to the WBW offer, along with Solo and Ant-Man and the Wasp. I saw this today and was going to post it but then I just saw now that you have hahaha. In HMV I bought Ant-Man &amp; The Wasp 3D (7.49), Solo 3D (7.49) and Ant-Man &amp; The Wasp UHD (9.99). I already had the UHD of Solo. Edit: Other BDs in the offer were Game Night and Get Out for 4.99 apiece. No Black Panther in my local. Because, like it or not, 3D was a fad. Ticket sales in the US always favour the 2D presentations and very few movies are made in 3D now, most are conversions. Since 2017 only four movies have been 'real' 3D. I love these, while simultaniously recognising they are massively overpriced bits of plastic rubbish. Bargain! Probably not much worth while left but sometimes you find a hidden gem in HMV. Good price. You can't beat a bit of Funky Pop. That might be the first time I've ever seen anyone apologise on this site (lol) kudos! Hey, dude. We appreciate the deal being posted. People are just having a joke with you. Nothing malicious. Sorry if it came across that way. Im sorry bro. Didnt mean to be a bad guy. Took them to show my brother, what would i possibly gain from lying? Was just trying to share a good deal that could possibly be still available. Wont bother next time with all the negative comments on here. I picked up bloodborne for £7 from asda about 18 months ago. Worth checking your locals guys! Got the last copy in the Stockport store today. I was asking around the store if still In stock but they couldn’t find any. The guy was looking around all the top floor and in the back. He said he couldn’t find it but maybe some on the desk at the tills on the ground floor. I went down and saw 1 copy....”Yonk....that’s mine I thank you”. Haha. Thanks OP. They had La La Land on 4K for same deal if anyone interested. I used to think my wireless headphones sounded good until I got a pair of these: https://www.amazon.co.uk/beyerdynamic-770-PRO-Studio-Headphones/dp/B0016MNAAI Yes, they cost £99 (at the time of writing), but the difference in sound is incredible, at least to my ears. These wired Sennheisers are also a very decent headphone. Depends on your usage. The difference. In Bluetooth and wired can be quite alot, even using ldac. Depends on the source, flac, 16/24bit will make a difference. Pretty much the same in Milton Keynes. Maybe I should have said disappointing. Cheers for all the heat folks. It actually looked like they were closing down their games section altogether. Nowhere in Carlisle ever seen to have any games cheap on these deals with HMV, Tesco etc. They don't even stock Xbox games in this case. Such a tinpot place to live, sigh. Serious bargain that! Heat Heat Heat! &gt; Pop vinyl What do we do about the zoomer problem? Support your local hmv with any purchase. Great shop. Are HMV stocking Venom yet? I’m with you OP on supporting HMV! Since 1921, HMV has been providing customers with the latest music releases and a wide range of catalogue titles in every format available. They expanded their range of home entertainment to include film and television content on VHS video cassette, DVD & Blu-ray. They also provide games for all the consoles available. They have grown over the years with more than 120 stores across the UK. Since the rise of the digital media, HMV has sought to diversify their product range to bring music and film to their customers by investing in downloading, festivals, cinema and venues. HMV has a strong brand recognition and a market share of around 25% for music, 25% for video and DVDs and nearly 10% for video games. www.hmv.com was launched in 1997, it was one of the first websites to offer a mail order facility and paid-for downloads. On their website, there is a Store Finder which locates your local shop via post code or towns. It also lets you know what is going on, for example signings or performances, in stores nearest to you. HMV advertises discounts and offers throughout the year on their website. At the beginning of the page there is a Sale section which includes DVDs, CDs and technology. Customers can find additional offers at certain points in the year, such as Black Friday and Cyber Monday, post-Christmas sales and mid-summer sales. Customers will often find multipack discounts on DVDs, Blu-rays and CDs. HMVdigital also offers offer low price albums and discounts on selected downloads. If customers sign up to receive HMV e-mails, they will be informed of the latest offers and discounts. Purehmv is the brand’s loyalty programme, which allows customers to gain loyalty points for downloads and items bought. The points can be redeemed in store or online. You also get exclusive surprises and offers, including signed merchandise, the opportunity to walk the red carpet with stars or backstage passes. Customers can also use the points to buy downloads or get money off online products. Points are earned by purchasing items from HMV. E-mails are sent to loyalty customers informing them of new releases, latest offers and rewards. Buying items from hmv.com is an easy process. First, customers must set up an account. They have the option to subscribe to the newsletter which gives information about trending music and films and access to exclusive interviews. HMV.com accept Amex, VISA, MasterCard, Maestro, PayPal and VISA. Delivery is free for any order over £10. Orders under £10 have a £2 delivery charge per order. A tracking service is available for £4.95 per order. HMV can only send items to UK addresses. Items are send 2nd class, which takes between 3-5 days. Royal Mail Tracked 24 service is available for an additional £4.95. HMV provides customers with a Click & Collect option, this is where the items are paid for as normal, but they are delivered to your nearest store. Customers must bring valid ID and their "Ready for collection" e-mail to the till with them. HMV accepts unwanted items, as long as they are returned within 14 days of receipt, in perfect condition, and unopened. If the item is damaged, HMV will offer a refund if it has been bought within 30 days. After 30 days, but within the warranty limit, HMV will offer to repair or replace the item. Take the item and the original receipt to any store, as well as any accompanying parts, accessories, cables, etc. Include the returns form, printed and filled in, the original receipt and any accessories that came with it. Print and fill out the returns form. Securely package the items and all the accessories included. Send it to the returns address. Items which contain a digital download will not be exchanged or refunded if they are opened. Inform HMV if the item is faulty and they will let you know what to do with it. HMV aims to deal with any refund within 3-5 working days. The HMV app gives customers access to millions of high-quality tracks and allows you to manage your music collection, download, sync and playback your purchases from hmvdigital. The HMV blog has exclusive interviews with top names in the music, film, and gaming industries. Find out what inspires artists to create what they do and what their next move will be. Phone: 03333 234754 (Monday to Friday 9am to 5pm). You can also send them a message through the contact formula on the Contact Us page. HotUKDeals has many deals that customers can use to get discounted products for a number of items on the HMV website or in the high-street shops, from DVDs, CDs, downloads, speakers, headphones, games and many more items. 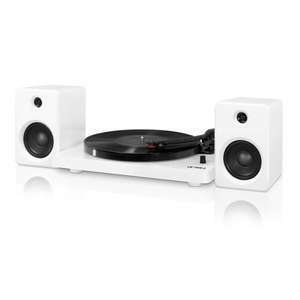 HMV vouchers and discount codes provided in conjunction with HotUKDeals allow customers to save money on a wide range of home entertainment products: music, games, tech and films. HMV discount vouchers offer great savings on 1000's of CDs, DVDs, Blu-ray, and games. With HMV and HotUKDeals, customers can get the latest music and film releases at the press of a couple of buttons.